There’s a different sort of Potter-mania going on in the Lake District with a magic all its own: an enchanting musical to celebrate 150 years of Beatrix Potter, with Lion King-style puppets and puppeteers bringing her creatures to pottering, leaping, chattering, sniffling, blundering and skittish life. Thanks to choreographer Sheila Carter, Steven Edis’s music and Alan Ayckbourn’s lyrics – Jemima rhymes with ‘sublimer’ – they also sing and dance to the manner born. What makes this show special is the exquisite attention to detail, the exact cut and colour of Mr Tod’s velvet waistcoat, the precise pink of the foxgloves, Jemima Puddle-Duck’s waggling, downy tail and flapping fringed silk shawl, so familiar from Potter’s illustrations and so faithfully recreated by theatre designer Roger Glossop. The scale of the piece is tiny but the ambition and the production values couldn’t be higher. 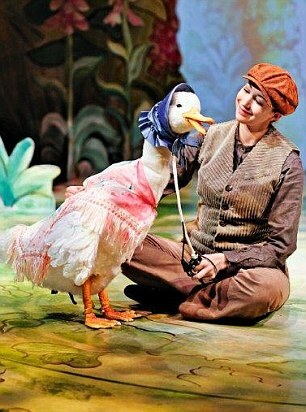 He’s also devised the somewhat rudimentary narrative, linking several tales through the central figure of Beatrix Potter (Danielle Morris) who has lost Peter Rabbit and needs Jemima Puddle-Duck (handled by a delightfully daffy Grace Eccle) to fly off and find him. But fluffy it is not. This is nature red in tooth and claw, just as Potter painted it, with a precocious Peter Rabbit a whisker from becoming rabbit pie (prompting one terrified child to squeal), a foxy Mr Tod catching bird-brained Jemima’s eye and a bristling and – amazingly – blinking Tommy Brock bunny-hunting. 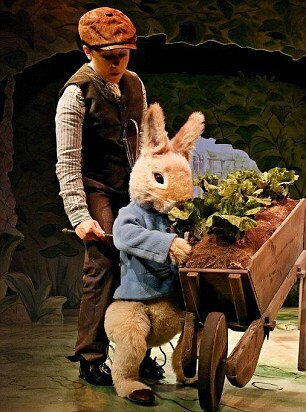 At one stage five Mr McGregors, dancing around wheelbarrows stuffed with prize-winning radishes and onions, deftly reflect the size of his threatening presence in Peter Rabbit’s imagination. There was just one collective ‘aah’ from the audience, tellingly for Kep the collie, entirely permissible because he, unlike the rest of the wild creatures, is a pet. Pure animal magic, and beautifully done.